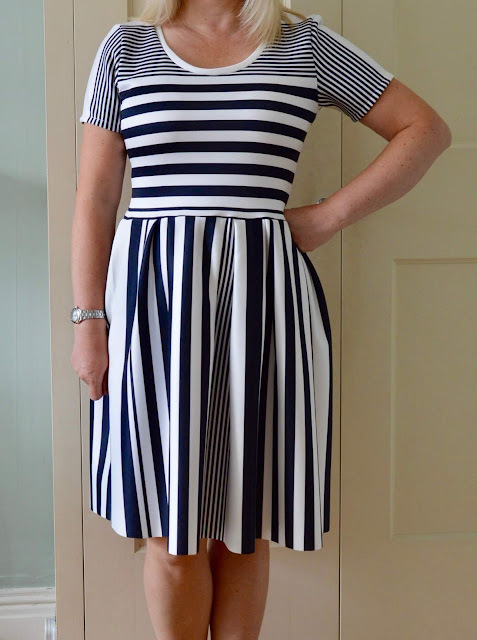 The original inspiration dress in question was this lovely Emery dress by Caz. Hers was made from a striped ponte from Minerva that was no longer in stock. 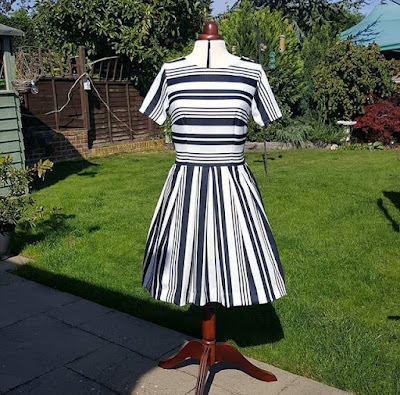 What was in stock (but not at the moment) was a similar looking striped scuba knit on sale at £7.99 a metre, so I bagged two metres to experiment with. One of the things I liked about Caz's dress was the way the bodice and skirt stripes ran in different directions. The stripes on my scuba aren't as uniform as the stripes on Caz's ponte - there are several different sections of broad, medium and narrow stripes - so I knew there'd be a bit of head scratching to get them in the exact position I wanted. 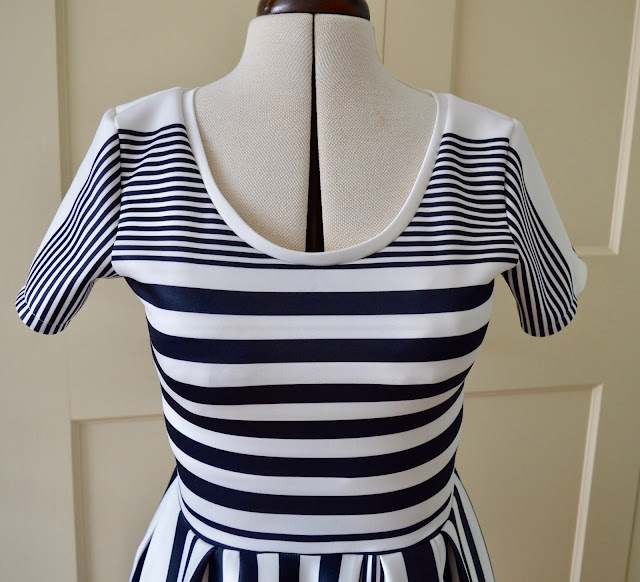 I ended up with the medium stripes across the main section of the bodice and narrower stripes at the top section. Much to my delight, I then jammily managed to continue the narrow striped section down the side of the sleeves (more or less). The skirt is a mixture of everything, but it can get away with it because of the vertical stripes. Pattern-wise I used the bodice from the Lady Skater dress as it's drafted for knits and fits me well, and the pleated skirt from the Mortmain dress. The only change I made was to shorten the bodice slightly - the original length ended up too far down from my natural waist and was causing a bit of rippling. It would probably have gone unnoticed in a solid coloured fabric, but the giant stripes really emphasised it. The whole dress was sewn on my overlocker, apart from the sleeve hems which I finished with a straight stretch stitch. The neckline is finished with a plain white neckband. The skirt hem has been left unfinished as I just preferred the look of it. One giant gamble I took when making this dress was to cut it out without allowing for a zip. The Lady Skater pattern doesn't have a zip anyway as it's designed for knits and I simply removed the zip seam allowance from the skirt pieces Because the scuba has a good amount of stretch to it, I can get the dress on without one, so the gamble paid off, yay! There are lots and lots of positives about this dress, along with one big, giant negative - I don't think it's very 'me'. Maybe it's a stripe too far (can there be such a thing?!) and I don't really wear this shape of dress any more. Also, despite being easy to sew with and magically stretchy, I've come to the conclusion (a bit late in the day, admittedly) that I don't particularly like scuba as a fabric. The texture always feels a bit cheap and nylon-y to me and I couldn't wait to get the dress off after taking these photos! I think it is lovely and looks very becoming on you. It's adorable and you did such a great job! 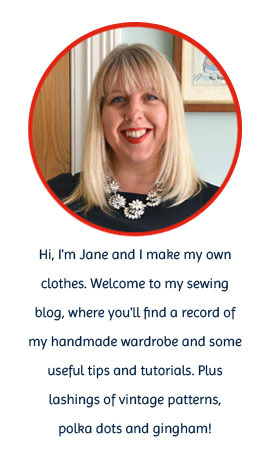 I like it, Jane, but if it doesn't feel "you" then you aren't going to enjoy wearing it. I think you might like it in cooler weather, even winter weather, with some tights. Scuba is very warm. 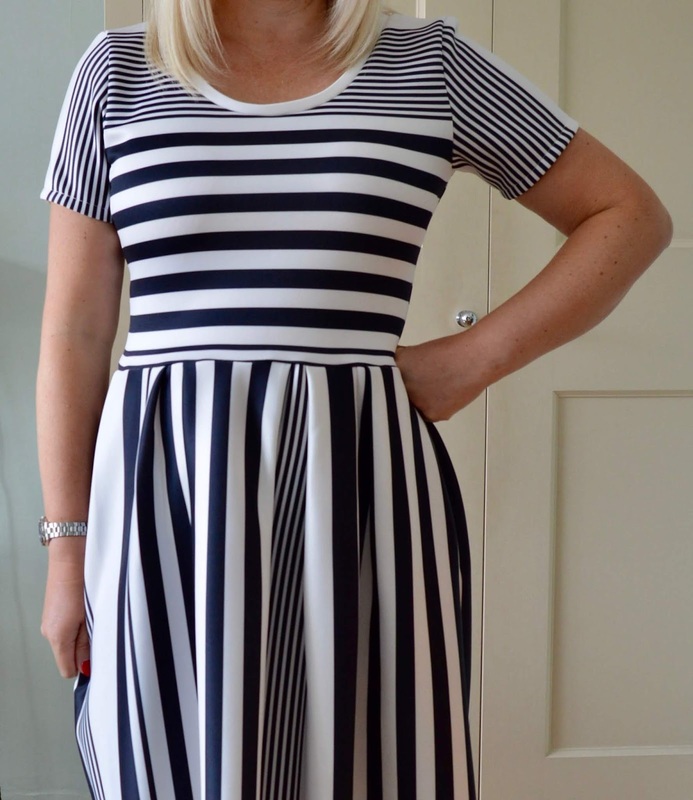 I can see you in this dress with navy tights and red shoes! Okay, if you don't like it, what about a "hack?" I'd cut off the skirt and use the top with a solid color rayon (for drape instead of body), and perhaps include a stripe at the bottom of the skirt to tie it together. The top is lovely and fits you beautifully. My problem with the skirt is that the fabric is too stiff to pleat and not stiff enough to show the shape of the skirt. Hacking is a good thing, yes. I LOVE the bodice! I was thinking the same, the top is really flattering and maybe the skirt would work better in solid navy? It seems more of a fashion fail than dressmaking one. It's beautifully made, just doesn't work for you. The bodice is really flattering on you and I like the narrow to larger stripes on it. How about taking the skirt off and re-cutting the skirt to either an a-line or modified pencil shape? That would take away the boxiness of the pleats. Or donating it to one of those organizations that help women get back on their feet by helping them find a job and get a professional wardrobe. I think everything about the dress is lovely, very stylish. I cannot see anything wrong with it....keep up the good work. Well the dress does look stunning, again beautifully made so I hope you have fun wearing it again. The dress looks nice on you and well made. I wonder if you added a belt and maybe a scarf you might like it better. I think the dress is nice and that you had fun puzzling out the stripe placements. Well done. The issue of you wanting to wear it is a separate question. If you don't end up wearing it, you gain the knowledge and give it away. I've got three fails on my sewing table right now. I took my best friend to the fabric store and she didn't let me buy fabric I liked but wouldn't wear. What I did buy was immediately and successfully made into a linen Sew House 7 tea dress. Lesson learned. She schooled me. It is a lovely dress, well done. I understand what you mean by sewing something that isn't your style. I do that more often than I'd like. Maybe it's because I'm still figuring out my style. Sometimes I'll make something outside of my comfort zone and really love it; other times it's a 'get it out of my system' sew. It looks lovely on you but I get what you mean about the feel of scuba fabric. I’ve loved many scuba prints but as soon as I’ve touched them I know I couldn’t wear it!